Wilfried Zaha has tweeted that he is delighted to have agreed a permanent return to Crystal Palace from Manchester United. Palace, who sold the 22-year-old winger to United for £15m in January 2013, re-signed him on loan in August. When completed the deal is expected to be worth an initial £3m. The fee could rise to £6m with add-ons, while United also have a sell-on clause. Zaha was the final signing made by Sir Alex Ferguson before retiring as Manchester United manager. On his arrival, the winger was immediately loaned back to Palace, helping them win promotion to the Premier League via the Championship play-offs in 2013. When he finally moved to Old Trafford he struggled to make an impact, playing just four times under David Moyes, Ferguson’s successor, before joining Cardiff on loan in January 2014. 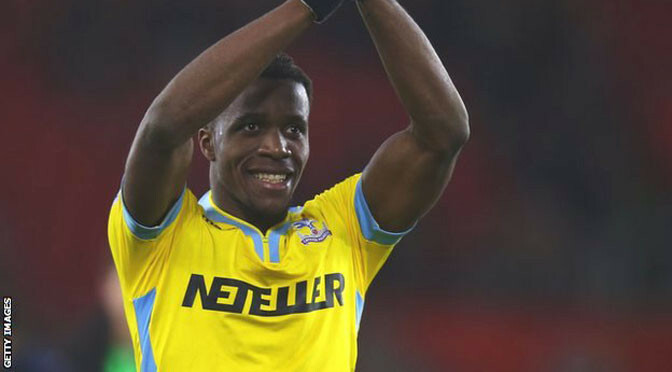 Zaha, who has been capped twice by England, marked his return to Palace by scoring in a 3-3 Premier League draw at Newcastle in August. Palace have also signed central midfielder Andreas Breimyr from Norwegian second-tier side Bryne FK. The 18-year-old, whose move is subject to international clearance, will be loaned back to Bryne until June.